The Center for Disease Control recommends an upward daily limit of 1,500 mg for sodium for almost 70% of the U.S. population. The proposed 2010 Dietary Guidelines for Americans also calls for that amount for everyone since they say it is good for most people. Of course the significance of these recommendations is that most people eat at least double this amount per day. It is NOT easy to lower the sodium in your diet because most of it comes from processed foods and restaurant meals - if you are not REALLY trying, you are going to be in the double-the-amount-you-should-eat group. But perhaps if you learn that excess sodium kills more people than tobacco; it is the number one cause of people entering nursing homes for life; and it is the cause of over 75% of the costs for medicare, you might want to be motivated to at least try. The best thing you can do is to read Nutrition Facts labels to find low-sodium choices of what you buy on a regular basis; additionally this also means you should cook more meals from home so you control what goes in your food. 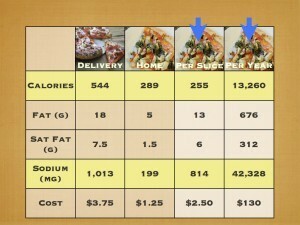 5% or less of the daily value for sodium is ideal. If you also eat out less often, you will make a dent in your intake. We have more recipes here and we are going to be updating them with pictures and videos to make it easy for everyone. Use lots of fresh veggies for flavor and color. Mushrooms, tomatoes, zucchini and peppers are some favorites. But don't be afraid to add even more or your favorites. Add plenty of herbs and seasonings. We like garlic granules, dried oregano, black pepper and fresh basil/herbs. Use a low-sodium sauce - such as a tomato sauce without added salt. We chose pomodoro tomato sauce because it costs less than bottled pasta sauce, has great flavor, and no salt! Sometimes, too, we will forego the cheese and just use a sprinkle of extra virgin olive oil and basil. Go really light on the cheese - we used a combo of shredded reduced fat cheddar and parmesan - they have a nice strong flavor so you can get away with adding a lot less. We also like farmer's cheese that is low in fat and sodium (you do have to hunt for it) or a light sprinkle of goat cheese, too. Buy or make a crust that has no more than 5-10% of the daily value for sodium (read the Nutrition Facts Label). Of course home-made whole grain crust is always the best but a low-sodium crust is preferable either way. And here is a shameless plug for our products - since we don't accept advertising because we want to be pro-healthy food (zucchini really doesn't have an advertising budget anyway) and proconsumer - here is our Nutrition Education Store: http://nutritioneducationstore.com - check out our new 8 Applications of Health which is bound to entertain any kid - it has a smart phone theme and teaches them to work on 8 real "applications" for health (move more, read labels, watch portions, choose wiser, more fruits/veggies, beverage better, etc) - better still it has a matching show for their parents - so you get 2 shows that have over 125 slides in 8 lessons - for a total of more than 250 slides PLUS 2 sets of handouts PLUS a new poster. This one is actually being taught to the employees of Apple very soon by one of our dietitian customers and it was written by Hollis Bass, MEd, RD, Food and Health Communications and a collection of artists and photographers! !